Good afternoon, I know you are all very tired and are over swept by the communications, so I am going to try to be brief. I am not going to read my paper because when I read a paper in English usually people don’t understand what I’ve said, so I am going to talk more freely. My starting point will be a sentence which is quite known among the art historians : “ce sont les regardeurs qui font les tableaux”, it’s the people who look at the picture that do the picture. It’s a Marcel Duchamp sentence and Fred Myers said in one of his articles “ce qui fait l’art… what does art is the place of its reception”, so he has the same idea as Marcel Duchamp: to look at art from the reception place. To follow this idea I am going to, very simply, show you a press review, and sentences which are for me the main focus of the articles about Australian art. And, mainly I am going to talk about the reception of the Quai Branly project and the exhibition that we closed Sunday night (Aux sources de la peinture aborigène, 09/10/12-20/01/13). It would be good one day to analyze the history of the relations between France and Australia. For the moment I will take examples from exhibitions I know about. There are probably more than that, but I take examples from all the main exhibitions that took place in France in the 80’s and in the 90’s. I have stopped my review in 2000. What I am going to do is to start with the 1993 exhibition at the Musée des Arts d’Afrique et d’Océanie (MAAO). This starting point has many reasons. One of them is that it was the first time that a national French museum showed modern painting s and it was also the starting point, in fact, in a very strange way, for the project of the musée du quai Branly. Starting from there is just to give you an idea of what was the reception at that time, so it’s a good starting point, and how it moved in time up to now. I must say that this 1993 exhibition was commented by Fred Myers in an article published in Terrain for a special issue on “le regard” (the gaze), once again what is it to look at something. The second reason is that, in an article, Fred Myers makes a review of all the evidence before 1993, so I’m not going back to that. Others and some of them are in the room like Barbara Glowczewski, Jessica De Largy Healy, Arnaud Morvan, have also have written on the reception of art. So, if you’re interested to have more documentation I send you back to those articles that are easy to find. For de Roux, acrylic paintings are stereotyped paintings ! You can find many quotes like that. There is another article where they said that acrylic painting is to bark painting what the paintings of the Place du Tertre in Montmartre are to the paintings of Matisse. It’s a terrible remark! What she explains is that the production of paintings was to sustain the community, and she writes in a very interesting way, that for the people something that she calls imagination is going on, that the forms are quite interesting, that they are new. Stephen Todd moves to a very political issue, the question of the center and the peripheral and behind that question the affirmation of a kind of French imperialism. Some of these ideas you will find them again in the Quai Branly project. Some are going to disappear. At the opening of the museum, two times were comments by the press. 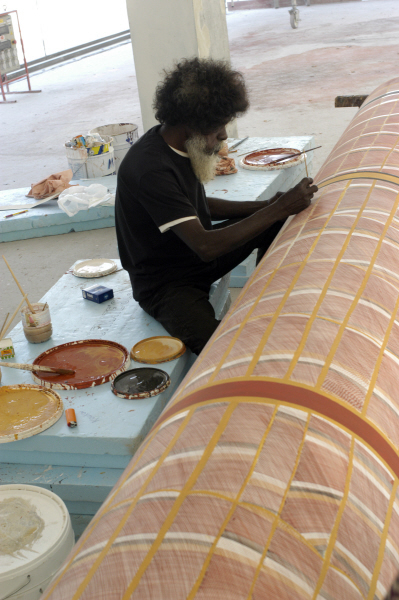 First was the year before the opening, in September 2005, when John Mawurndjul came to Paris to paint the column which is now in the book store. At that same time some press reviews were published in Australia about the people who were involved in the project. The second time was when we opened the museum in June 2006. The Australian project at the musée du quai Branly was a cooperative project between France and Australia. At the beginning we never thought that this cooperation was going to be set up! We were very surprised when the Australian Prime Minister sent us a letter and said “Banco I’m going to give you money to do those paintings, I’m going to help you do that”. It was quite surprising. It was the time of the Iraq war and it was shortly after the time of the nuclear bombing in the Pacific Ocean by the French, it was tricky time for the relations between France and Australia! 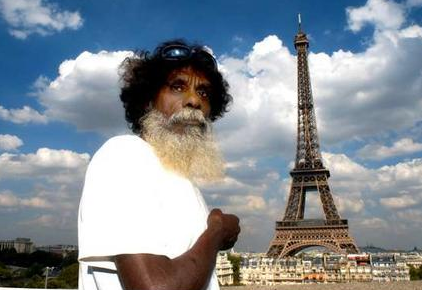 When John Mawurndjul was in Paris, there were a lot of articles published about his work. And a lot of articles were illustrated by this picture showing John working. It was remarkable because it shifted the focus from paintings, to an artist at work. The relation with the press was quite different because there was something going on, something to see. You could show someone working, not an abstract painting coming from Australia! The other thing for the press, especially the French one, was that John does not want to talk. They are used to having artists who talk, comment, but John refused to talk, he was happy to let Apolline Kohen, the art manager of the art center of his community, talk. This was a surprise for the French journalists. And Apolline said “John is painting a thing that is sacred”. And she couldn’t comment more than this. This was the end… So the journalists could in there paper only describe the artist but couldn’t really comment on what he was doing. The other photo that was really widely published was John in front of the Eiffel Tower! I don’t think I need to comment it. It is really a strange image who can be read in two ways. This picture had been reproduced widely. The journalists often quote a sentence by the artist Judy Watson who didn’t come at that time but it was published in the Herald Sun on June 21; Judy “we are swallowing the building”, you know, the artists’ are swallowing the building. So it was quite interesting to see how the artists make appropriation of the building. It was no more the building of the musée du quai Branly, it was the building that the artists were going to invest. They started to say that they had a very deep relation with that building and what they were doing with it. They have the conscience that what they were doing was very important for Australia. The same thing is almost said by Gulumbu (Yunupingu), she even added a little more. She said : “my stories are going to be in Paris”. Later, when she came for the opening, she developed the idea of a bridge between Paris and her society. This idea of a bridge was widely reproduced by the press at that time. I don’t need to comment. The sentence is clear. The building is seen as an Australian extension, a kind of reverse imperialism! The French don’t conquer Australia, Australia is conquering France and Paris! The second time was the opening of the building, you know that eight artists have been chosen for the building: four women and four men coming from different regions in Australia, and among those were two urban artists, Michael Riley and Judy Watson. At the opening not all the artists came. Only a few. John Mawurndjul, Gulumbu, Judy Watson come and Tommy Watson was represented by an artist called Dawson. Ningura Napurrurla didn’t come. She became ill a few weeks before the opening and couldn’t come. Interestingly enough, for the opening we have a very large review in the international press. In the archive it occupies at least 1 meter long. Interestingly enough too, none of the French press comment on the Australian building! You won’t find any reference. Everything was focalized on the opening. And God knows how we have been attacked! To have comment on the Australian painting you have to lock at the Australian press. The comparison with the 17th century comes in fact from Jean Nouvel himself. Jean Nouvel was very clear that his idea to paint the celling of the building come from the fact that when you walk in the street in Paris at night, in some areas, especially old areas, and you look inside the apartment buildings, you see painted ceilings. He did not mention the ”Grande Galerie” in Versailles but the idea is just behind. So, it started a kind of a controversy about the building: is it in a French tradition ? Where are we? French tradition or Aboriginal tradition? Gulumbu wanted all of us to be under the same sky and the building to be a bridge between her and there. But I think it was a much deeper meaning in the speech of Gulumbu. Jessica De Largy Healy commented about those.i There was much more meaning behind what Gulumbu said! The third example is the press comments on the exhibition that we closed on Monday night. This exhibition was organized by the National Gallery of Victoria and Museum Victoria. The two curators were Judith Ryan and Phillip Batty. It is an exhibition we brought from the NGV without interfering with the setup, with the exhibition. The focus of the exhibition was to show what happened in Papunya in 1971-1972, with the idea that the Papunya paintings were coming from a tradition before. This is why we had that opening rooms with the shields that you see on the left of the picture. They are shields which were collected by Spencer & Gillen. They were shown in an introduction room. The exhibition, for those who didn’t see it, presented 280 paintings organised by artists. It was presentation of some of the production by twenty artists during two years. So, it was a very pedagogical exhibition. And the French press did understand suddenly that there was a deep history behind those Aboriginal paintings. It’s what they started to understand. An article in Le Temps, by Laurent Wolfe, raised a historical question: why does it start in Papunya at that time? For which reasons did the movement start in Papunya in 1971? The other point is that the critics understood that those paintings were contemporary art, a point that was made in 1993 in the MAAO exhibition, but was denied at the time and finally accepted twenty years later! « There is not one school of painting but many Aboriginal painters, singular artists that draw on their stylistic sources and themes on the painting of the desert to reinvent forms anew.” Pierre Grundmann, L’objet d’art, November 1, 2012. And it goes even further. Some critics start to ask this question: are those paintings pure paintings? Do they have relation with traditional paintings? Are we in front of pure landscape paintings? In one of the articles, the question is raised: are we in front of pure landscape paintings without history behind? Do Aboriginals painters try to capture simply the change of light in the countryside? Or are we still in paintings that are in relation with myths and sites? Those questions raise another one which is probably going to be one of the main one in the coming years, to read historically that movement. The question for some of the European critics is not to read those painting as modern but something which belongs to a history. i De LargyHealy 2009, « My art talks about link’: the peregrinations of Yolngu art in the globalised world », in Anderson, J. (dir.) Crossing Cultures: Conflict, Migration and Convergence, Melbourne: The Miegunyah Press, pp 817-822.